Photos courtesy of Linda Violett. Nest description: Nest cup of bark shreds, fine moss, grass, plant down, fur, hair, cocoons and other soft fibrous materials, most incorporate feathers. May also contain snake skin and bits of cloth (wool or cotton) and papery material from wasp nests, string, grass blades. Never include conifer seed wings (see Brown-headed Nuthatch). May also "caulk" nest site cracks with hair and feathers. Eggs are short subelliptical to short-oval, little or no gloss, white, unevenly and sparingly speckled or finely spotted with chestnut-red, reddish/purplish brown, with heavier markings often at the large end. 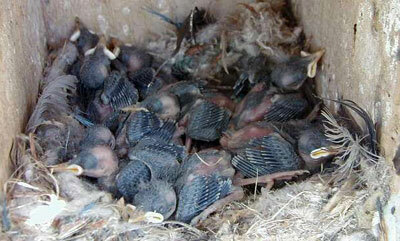 Pygmy Nuthatch nestlings that are a few days old. There are nine chicks in the photo above. 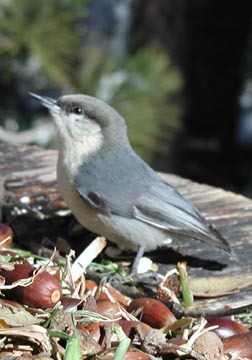 Most sources say that Pygmy Nuthatches typically lay 6-8 eggs, with an average of 7, but 4-9 is possible. 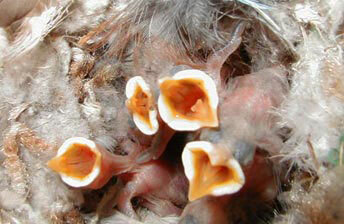 She had them nesting in CA in a box that was hung about 15 feet high, with a 5x5" floor and two 1.25" round holes. Pygmy Nuthatches seem more aggressive than Mountain Chickadees and may out compete them for nestbox occupancy. Linda has noted that Pygmies will cooperatively nest, with several adults defending the box and caring for the young. Pygmy nuthatches are very social, with flock members calling to each other constantly, and roosting and breeding communally. In San Diego County, they commonly nest in pine snags, but also use big-cone Douglas Fir or Oak if mixed with pines. They lay from May 4 - June 5.